We would all like to think our fun-filled boating excursions will always be perfect and without incident. But the truth is, accidents happen when you least it expect them. And when they do we are often frightened, confused and in a state of shock. For this reason, prepared boaters carry a boat bag onboard. You might also hear them referred to as a ditch bag or an abandon ship bag. Regardless of what you prefer to call it, the function remains the same – to securely hold key survival tools in a reliable waterproof container that will keep you alive and signal potential rescuers. So, we suggest you start with a durable ditch bag and don’t skimp on quality – or the contents! The ACR/Artex RapidDitch® and RapidDitch Express® boat bags are a good place to start and come highly rated for their state-of-the-art marine life-saving equipment. But, there are many reputable brands available. Next, is what to pack in your boat bag. Ultimately, these life-saving contents could determine your fate – a.k.a. the real meat and potatoes that will keep you alive and get you rescued. We’ve created a 15 item shopping list of the suggested items – entailed with their function. Add items as you deem necessary. EPIRB – Emergency Positioning Indicating Beacons will send your exact coordinates to satellites and notify rescuers. PLB – Personal Locating Beacons attach to lifejackets sending a distress beacon in case you’re separated from the EPIRB. Handheld Waterproof Radio – Used to contact nearby vessels within 5-10 miles and can send out distress calls with GPS positioning. Waterproof Flashlight – Nighttime illumination. Strobe Light – Better to spot you at nighttime. Handheld Red Flares – Minimum of 3 is required by law and can be seen for up to 5 miles. Orange Smoke Signals – Minimum of 3 is required by law. Flare Gun – Keep a minimum of 3 flares, as they can be seen from 10-25 miles away depending on conditions. Nutrition Bars – i.e. granola bars, Power Bars®, or USCG approved S.O.S. Datrex® survival food bars. Pocket Knife – A simple pocket knife can come in handy if you or your gear become entangled. 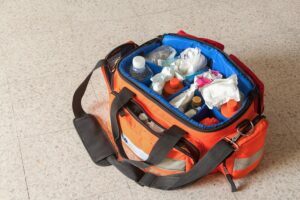 First Aid Kit – Keep it stocked and learn how to use proper life saving first aid techniques and supplies. Medication – Limited to important medications for treating blood pressure, diabetes, or an Epipen®. Make it a habit to inspect expiration dates on flares, batteries, food products and medications quarterly to ensure freshness. Additionally, keep extra batteries for the electronic items in your boat bag. While you may be headed out for a day of fun on the lake, it’s always best to be prepared in case of a sudden storm or emergency on your boat. Remember: Never leave the dock without a boat bag onboard and always stay with your boat!